Have you ever thought about vacation on another planet? No?? You should know that scientist thought about it already and here we proudly present you TOP 5 of the most promising exoplanets where life could exist. Scientists from the “Laboratory of habitable planets” (PHL) of the University of Puerto Rico released a list of the five most likely candidates for Earth-like planets already known exoplanets. The coolest thing about this space bodies is their promising physical conditions which might be optimal for the life to emerge. 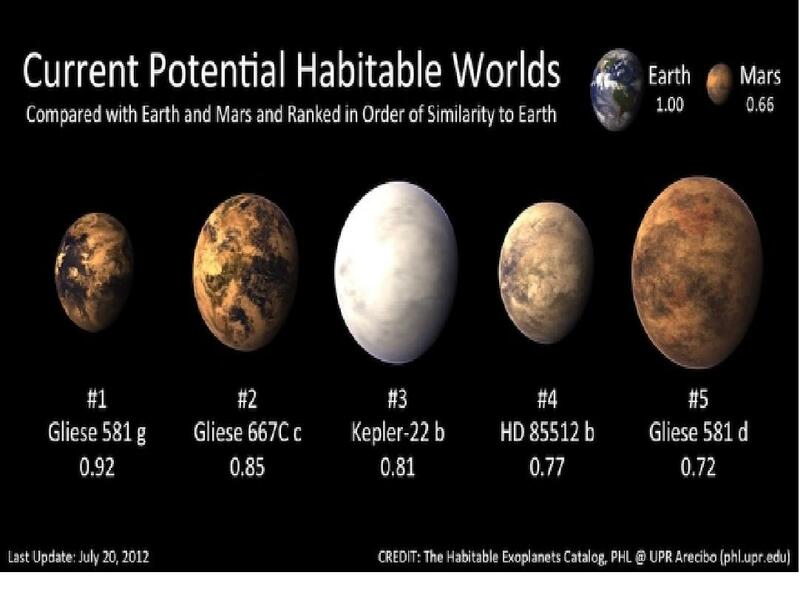 First place in TOP 5 list belongs to the planet Gliese 581g. Along with three of its neighbors it orbits a red dwarf named “Gliese 581”. Two brothers of Gliese 581g (planets Gliese 581d, Gliese 667s) together with Kepler-22b and HD85512b are also in the list. Soon after the discovery of Gliese 581g there were certain doubts as to its existence, but the team of scientists, led by Steven S. Vogt (Steven S. Vogt)-University of California, Santa Cruz – has presented new evidences. They are based on the fact that four planets that revolve around Gliese 581 have not elliptical but circular orbits. Based on these observations, the researchers presented the Gliese 591g, which has at least 2.2 mass of the Earth and rotates in the so-called “habitable” zone of the star. This means that the distance from the star, mild temperatures and the presence of the water on the surface could create the conditions for the emergence of life. In addition, Vogt has calculated that the radius of Gliese 591 g greater than the radius of the Earth around 1.5 times. The star Gliese 581 is weaker than the Sun, however, the orbit of Gliese 581g is so close to it that the planet receives as much sunlight and energy, as our Earth. These factors place Gliese 581 g in the first place in the TOP 5 of all currently known extrasolar planets similar to the Earth. Isn’t is a perfect place for new TheValiense concert?? See you all there and very soon!!! !